A gate intercom lets visitors ask you for permission to enter your property, and allows you to verify their identity without having to come out and check in person. Intercoms aren’t exactly a recent invention, but modern technology has improved them significantly, particularly by integrating them with other communication networks. Old fashioned intercoms have a wire connecting the electric gate to the control unit inside your home or business, like a landline telephone connection. These wired systems are still in use today, and tend to be cheaper and easier to set up than the more advanced options. However, the connecting wire is vulnerable to damage, especially if the gate is a long way from the building, and the control options tend to be limited. More modern wireless intercoms don’t have these issues, but may have limited range unless they’re connected to a phone or a satellite network, and can be unreliable if your property has signal issues. Most intercoms have a simple microphone/speaker setup on each end that lets you speak to whoever is asking to be let in. Some more recent models also come with video cameras, that will let you see as well as hear the visitors and better confirm their identity. Video intercom systems often have smartphone compatibility, so you can see the caller even if you aren’t home at the moment. Some intercoms have DECT (Digitally Enhanced Cordless Telecommunications) technology, which allows them to connect to your landline telephone, making it so that you don’t need a separate control node. Many more modern intercom systems can also be connected to a smartphone application, so that you can receive calls from visitors at your gate and decide to let them in even when you aren’t at home: very useful if you have children or hired help. Keep in mind, however, that smartphone controlled gates come with digital security risks. 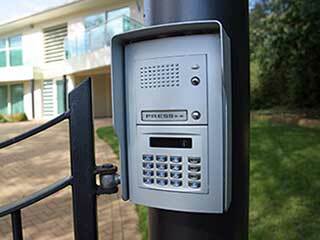 Intercoms are just one of the many extra features you can add to your driveway gate. Keep exploring our blog to learn about others, or call us for intercom and gate installation or repair services. Our team will be happy to hear from you!